RPF Admit Card 2018-19: RPF Constable Admit Card/ Call Letter is now available on the official website. The Officials have released the RPF Call letters for both SI and Constable for the 2nd round of PET, PMT and DV. Besides that, the RPF Call letters for the 1st round of PET, PMT, and DV are also present on the official website. RPF SI Group A and E admit cards/ call letters are released for the 2nd round of PET, PMT and DV. Whereas, RPF Constable group E call letter for the 2nd round of PET, PMT, and DV has been released. To download RPF Admit Card, aspirants will have to login by entering their Registration Number & Date of Birth. RPF Constables SI CBT has been successfully conducted and RPF Constable exam is going on. The admit cards are usually released 10 days before the conduction of the exam. The hard copy of RPF Constables Admit Card will not be available. It is mandatory to download the admit card and take a print out of the Admit Card for appearing in RPF examination. Read instructions printed on admit card/ call letter carefully. If there are any particular documents mentioned in instructions keep them ready to carry for the exam. For more information regarding RPF Admit card, read the article below. RPF has now released the Call letters for the PMT. PET and DV for both SI and Constable. As per the recent update, RPF has released the Call letter for the 2nd round. RPF SI group A and E admit card and RPF Constable group E Admit card is released for now. Meanwhile, RPF has successfully conducted the CBT and declared the RPF result for the CBT Conducted. Meanwhile, the call letters for first round of Physical Measurement Test (PMT), Physical Efficiency Test (PET), and Document Verification (DV) were released and now, the second round of PET, PMT, and DV will be conducted for which the RPF SI & constable call letter has been released. The candidates need to download their respective RPF Call Letters for round 2 PET, PMT & DV which has been released on the official website. Note that RPF has released the Admit card/ Call Letter for PET, PMT and DV and candidates will have to download their respective RPF Call letters. Step-4 A login window will appear. Step-5 Enter your Registration Number and Date of Birth. Step-6 Now click on Submit button, RPF Admit Card/Call Letter will be shown on the computer screen. Step-7 Read all the instructions carefully and check all the details. Step-8 Download & take a print out of the RPF Admit Card. Step-9 Keep the RPF Admit Card safely for future reference. RPF has released the list of candidates who have been selected for the Round 2 PET, PMT, and DV. Download it from the link below. RPF has released the list of candidates who have been selected for the Round 1 PET, PMT, and DV. Download it from the link below. Aspirants are not allowed to carry any baggage inside the center. The RPF board won’t be responsible for any item stolen or lost. Smoking and eating inside the center, are strictly prohibited. Students are not allowed to bring tea, coffee, cold drinks or snacks inside the hall. Items not allowed inside the examination hall are given below. The RPF selection will be based on 3 stages, check out the selection process for SI & Constable posts. What if I need to make some changes after the final submission of RPF Application form? Note that the correction of state, email and mobile number cannot be done. Except for these three everything can be corrected by paying the modification fees of Rs. 250. Also, the modification can be done only twice and has to be done before the closing date. Login again and make the necessary changes and submit. Take the printout of your latest application form. How I will be notified about the RPF admit card once it gets released? You will be notified through email and SMS which you have provided during filling of RPF Application form. Also, RPF generally releases admit card 10 days before the Exam. We hope that this detailed article on RPF Admit Card helps you. If you have any query regarding RPF Admit Card or the exam in general, drop a comment below and we will get back to you. Okay, i din’t see nothing till now, so, the Exam Admit Card is already issued or else……? Your exam center will be mentioned on your admit card. When will be issue admit card, and how to download it? Hey Ajay, please keep an eye on the official website. Keep an eye on the official website. Hey Devendra, how may I help you? Hey, RPF admit card is not released yet. The dates will be released soon. Please keep an eye on the official website. Hey the admit card is not released yet. Please keep an eye on the official website. Sir i cant upload my admit card of RPF constable please help me.Invalid id password show ho rha hai sir. Check the inbox of your registered mail ID or phone number. Not yet, Akhil. Keep an eye on the official website. Hey Varsha, the admit card has not been released yet. Hitender, the Admit Card has not been issued yet. Hey, the admit card has not been released yet. Hey, not yet. Please keep an eye on the official website. Hello can any tell me RPF constable exam date has come ??? September its showing in website or October ???? ME AND MY FRIEND TOGETHER FILLED UP FORM. BUT HE GOT EXAM DATE AND ADMIT CARD I HAVE NOT RECEIVED ANY CONFIRMATION. AND CANT LOGIN WITH MY REGISTRATION NUMBER ALSO. Not yet. Keep an eye on the official website. Hey, please keep an eye on the official website. It will be released soon. Hey, RPF Admit Card is not released yet. Keep an eye on the official website. Hey Akhilesh, please keep an eye on the official website. It’s not released yet, buddy. Keep an eye on the official website. It’s not released yet. Hey, how may I help you? RPF Admit card hasn’t been released yet. Keep an eye on the official website. Soon. Please keep an eye on the official website. Hey, it will be released soon. Keep an eye on the official website. Hey, admit card for RPF exam is not released yet. Hey Aashish, it’s not declared yet. Keep an eye on the official website. Hey Vinod, the admit card for RPF is not released yet. Hey Udhaya, we are not the official authority. Please contact the official authority. Hey Arvind, the admit card is not released yet. Keep an eye on the official website. You mean admit card? Very soon. Keep an eye on the official website. Very soon. Keep an eye on the official website. Admit card not yet release,kindly confirm the date of release admit card. Abhijit, the admit card is not released yet. Keep an ye on the Indian Railways website. Soon. Keep an eye on the official website. I am just checking website but that there admit card is not available also official notification showing that RPF exam in SEP to OCT so I am Confussing please reply me. hey, which exam are you referring to? Sir I made a mistake in my form I need to correct it if you have any idea about that? ??? Please suggest me what to do??? But modification date has already been closed sir.. What to do now. .
It’s not been released yet, buddy. Very soon, buddy. Please keep an eye on the official website. You mean RPF exam? The dates are not released yet. Nor the admit card. RPF SI Exam date Plz..
Once it is announced we will notify you. No bro, exam date has not been announced yet. Please don’t spread false information. Tentative exam of September / October but Exam time did not fixed and Middle of October yet,When did the exam dated fix. Plz give positive responsed soon. The exam date is yet to be announced on the official website. I know already announced but date not fix, that why? sir….pls announce the admit card release date sir…. It has not been announced yet. Once it is released we will notify you through email or push notification. how do i get to know my rpf constable exam date????? Exam Date will be available on the official website however, still not announced. The board has not yet announced the release dates for Hall Ticket. Candidate will get notified regarding the hall ticket by email and SMS . The hall ticket will be released on the official website. The e-call letter/ hall ticket will usually be released 10 days before the Computer Based Test. sir i have total confusion on it. The admit card release date is yet to be announced. The exam date are also not announced. We will notify you once released. Sure, we will notify you once announced. 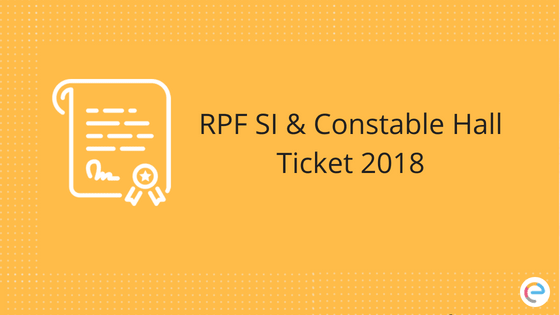 WHEN RPF SI 2018 EXAM WILL BE CONDUCTED.WHAT IS THE ADMIT CARD RELEASE DATE? Officially not yet announced, keep an eye on the official website. Eligible Candidates ko Call letter/ Hall ticket/ admit card upload karne ki information emails or SMS se bhej di jaegi. candidates exam ke 10 days before official website se download kar sakte hain. You can get the official notification from emails and SMS after the call letters/ Admit card/ Hall ticket will be uploaded by the board. Generally, you can get it by 10 days before the exam date. Exam was expected to happen in September/ October, 2018 but exact dates are still not out. Dates of RPF, examination is still not declared. We will update once they are released. admit card release date is not yet declared officially. We will update you once the dates are announced. The RPF exam date is yet to be officially announced. The dates are expected very soon and we will update you on that. It is yet to be released, will keep you notify about it. The Candidates will be receiving SMS and Email alerts regarding the Hall ticket/ call letter on their registered mobile number and email ID. You can also go through the official website. The official exam dates are yet to be released. Hall ticket is usually released 10 days before the exam. We will update you regarding the upcoming events. Will we get the userID via both SMS and Email ID? Because I had lost my Email ID and couldn’t get my required details0 if I will not receive an SMS. By user ID you mean Registration ID. Then Yes, the Registration ID and the password must have already been sent to your mobile number. Check the messages you will get it. I hope that you have not deleted that message because registration ID and password are required for downloading the admit card. Then I suggest that you contact official authorities and let them know about your situation. They will help you out. How can I contact them. then at right and top most corner. and select Help Desk. You can post your query over their. We guess the exam will be conducted in 3rd week of December. Please go through the details step of downloading the admit card in this article. RPF Admit Card releasing date is November 16th, 2018. Admit card will be released by Nov 16th, 2018. You’re eligible for the RPF SI. Kindly do not stop your preparation. The admit card will be released in November, Please keep an eye on the official website. Details are given on the official website itself, please check carefully. The admit card will be released by last of November, 2018.
sir when will the admit card for rpf (exserviceman) release???? when will the RPF admit card for constable release?? RPF admit card will tentatively release on 9th December, 10 days before the RPF examination. You can download the same at indianrailways.gov.in. RPF Admit card will be released on 9th December 2018. You can try downloading the RPF Admit Card by entering the email id that you used while registering for the exam. above link for only RPF hall ticket link or SI Rpf also please revert. because I was not fount admit card category. Sorry to hear that. But we cannot do anything regarding this issue. I request you to raise this to official authorities of RPF. Hey Abjal, Abhitak to admit card release nahi hua. Going to be released very soon. Hi Lalit Kumar, As per the sources the admit card will be released 10 days before the RPF examination. So kindly keep an eye on the official website and once the RPF admit card is released we will notify here also. RPF Admit card Group F is expected to be released by 10 days before the exam (which is on 17th to 25th January 2019), that means you can expect it by 7th January 2019. Hello Mr. Hahaha. If you are expecting RPF Admit Card for Constable Group f. Then it will be released by today or tomorrow. No mr. hahaha. We are not sure. This info has been gathered from official sources. Hi, Mr hahaha. Wait until the end of the day, If it’s not released by today then wait until tomorrow. If not then a day after tomorrow… All we can do is wait for the official authorities to release the admit card. RPF Constable Admit card Group B ka e-call letter 7th to 15th January 2019 tak aa sakta hai. Hey Manikandan, RPF Admit Card for Group A will be tentatively released in the first week of January 2019. We will update here once it is released and also kindly keep an eye on the official website as well. Hey Saddam Hussain, You can retrieve your registration number with the help of your Email id and Mobile number. Kindly check your email as the RPF recruitment Board officials will send a confirmation link with Registration Number after the successful registration. Thank you (anonymous person from the VaccancyJobAlert) for appreciating this post. It is expected to get released by 10 days before the exam. Since the exam will start from 2nd February. Admit card might get released by 22nd January. Hello Ajoy, The Group C Admit card download link for SI as well as constable is not yet made available by RPF. Hi Sunil Kumar, Yes you can check your Exam Center with the help of your RPF Registration Number. Click on the link download admit card and enter the registration number and date of birth. Your Admit Card will be displayed on the screen and from the admit card you can view your exam center. Yes, you can check your Exam Center with the help of your RPF Registration Number. Click on the link download admit card and enter the registration number and date of birth. Your Admit Card will be displayed on the screen and from the admit card you can view your exam center. RPF constable group f admit card is not yet released. It is expected to be released by 7th January 2019. The RPF Constable group A, B and F exam is scheduled from 17th to 25th January 2019 and the admit card is usually released by the board 10 days before the exam date. Usually, the admit card will be released 10 days before the exam date. But if you can be precise on the group or phase you are attempting, I can give you the right information. jaldi hee aayaga exam date ke 10 days pehle admit card aajata hai. RPF SI group D Admit Card 30th December 2018 tak aajayega and RPF Constable group D Admit Card 23rd January 2019 tak aasakta hai. For RPF Constable you can expect it by 22nd January 2019. RPF Constable Group B ka Admit Card 7th January ke aas paas tak release hoojayaga. RPF SI group A admit card is already released and you can download it. RPF constable group C and D exam 2nd February se 19th February tak hooga. RPF SI Admit Card for group D will be released by 30th December 2018. However, if you are referring to RPF Constable group D Admit Card it is expected to release by 23rd January 2019.
when will admitcard for group D for constable be out?? RPF constable group D is likely to be released by 23rd January 2019. Keep an eye on the official website. RPF SI Group C Admit Card 30th December tak release hoo sakta hai aur RPF constable group C Admit Card 23rd January tak aajayega. If you have lost your registered mobile number. You will not be able to retrieve your Registration Number. However, if that number is your Registered Number then you should be getting some notifications where your registration number is written. Ravikantji, The Registered mobile no is there, only the SMS message is deleted, now receiving some notifications on the same no but nowhere registration no mentioned in it. even tried getting the on website with name dob email id etc. saying ‘error try again’ . So how to get that registration No for getting admit card. I guess it cannot be helped. Why don’t you try contacting the official authorities? They will surely help you out. The RPF SI Group A admit card is likely to be available till the exam date that is 6th January 2019. Sorry to say that damisettanandaprab, You cannot change the exam dates. RPF SI group A ka Admit card release hoo chuka hai aur RPF Constable group A admit card 7th January tak aasakta hai. RPF Constable Group B ka admit Card 7th January tak aasakta hai. By the way agar aap RPF SI group B admit card ke baareme janna chahte hai to wo already release ho gaya hai. RPF constable group A admit card is likely to be released by 7th January 2019. However, RPF SI group A admit card is already released and is available for download. Hi Khushank, Your exam center will be mentioned on the Admit Card with all the necessary details. So kindly check your Admit Card. Hello Goutam Barman, RPF admit card group c ka admit card 22nd January tak Nikal Jana chaiye. RPF admit cardz exam se 10 din pahle tak Nikal jata hai. Iss case me exam 2nd February Ko hai. That means 22nd February tak admit card aa Jana chaiye. Hello Dudekula, You can expect admit card to be released by admit card to be released by 10 days before the exam. However don’t expect us to send you notification on your email id. We suggest you to keep an eye on official website. Hello Sagr, you can expect RPF group a hallticket by 7th January. However it can take few more days. what about RPF constable admit card Group A ? When its goona Release ? Hello Kali Chandra Shekar, RPF Constable Group A Admit card will be releasing today. No Basheer, it’s not yet released. But it will be released by today or tomorrow. Hello Venkatesh, RPF Constable Group A ka exam 17 se 25 tak hai. Aur Admit card aaj ya kal tak aa jana chaiye. Here is the official link https://constable1.rpfonlinereg.org/calllet.html. Jab release hoga to issi link pe group A,B and F ha link aa jaye ga.
Hello Khushank, RPF SI ke centres sare zone me milte hai. Hi Mss Prudvi, RPF Group F Admit card should be released by today or tomorrow according to RPF. I know that the RPF Admit card is not yet released which might be frustrating for many candidates. However, please have patience and expect the admit card pretty soon. Hi Manu, RPF Group A Admit card for constable is not yet released. You can expect it by today or tomorrow. Hello Kanth, It is not yet released. They were suppose to release it today. You can expect it by today or tomorrow. Hello Lun, If you are asking for RPF Group F Admit card for SI then it’s got released on 9th December. For Constable it should be released by 8th or 9th January 2019. Hi, Mr Hahaha. I wish that RPF had released the Admit card by now. But I cannot help you with this. Please have patience, RPF will be releasing the admit card pretty soon. So keep an eye on the official website. No Mr. hahaha, It’s okay to poke me regarding this issue. What you are facing is okay to feel. Please don’t be sorry. Apologies if I have offended you from my previous reply. I wish RPF releases the admit card pretty soon since a lot of candidates like you are waiting for it. You can expect it by tomorrow or after a few days. RPF constable Group A admit card jaldi hee aanewala hai. Official website par nazar banaye rakhiye. As per my knowledge, the official authorities of RPF don’t send any message or mail regarding the exam date. You’re supposed to keep eyes on the official notification for the same. Wish you all the best. pls advise when will be released rpf group f admit card. RPF constable group c ka admit card 23rd January tak aasakta hai. Official website par nazar banaiye rakhe. RPF Constable group B admit card aajkal me hi aanewala hai. Official website par nazar banaye rakhe. Hey Bittu, you can download your Admit Card from the official website. Hi Dalima bhoi, the exam will commence from 2nd to 19th February 2019. RPF Constable group C ka admit card aaj ya kal me he aanewala hai. Official website par nazar banaye rakhe. RPF Group C ka Admit Card ab aagaya hai. redownload kar sakta hu kya. Hum aapki chinta samajhsakte hai. Aap ko bata de ki 2nd February se RPF constable group C aur group D ka exam hoone wala hai. Jaha tak admit card ka sawal hai official website par group c aur d ka admit card available hai. Aap apna admit card abhi download kar sakte hai. Waise to abhi official website par group A,B,C,D aur F saare link available hai. DEAR SIR MY REGISTRATION NO IS FORGETTAN. Do not worry. You would have received the Registration Number on your registered mobile number and Email ID when you registered for the exam. Just check your email or the text message on your phone to get the registration Number. Mera registration no mujhe malum nhi hai aur forgot karne se details no match likhata hai help pls. Please check your registered mobile phone or Email Id to get the Registration number. As i checked my registration number is showing incorrect please resolve my issue sir urgent. in case of any concern please revert on the same. Aftab, May I know which group are you from? Aniket kya aap mujhe apni pareshani bata sakte hain taaki main aapki acchi tarah sahayeta kar sakun? GD contable ka admit card kab niklega? SSC GD constable ka admit card abhi nahi nikla hai . jald he niklane wala hai. Agar apka question RPF Constable admit card par hai to RPF constable ka admit card already release ho chuka hai. RPF Constable Group B ka exam already ho chuka hai. RPF Constable group B exam 17th se 25th January 2019 tak conduct kiya gaya tha. Official website par RPF Constable Group C aur D ka admit card available hai kyuki exam abhi chalraha hai aur 19th February ko complete hooga. Group B ka exam ho chuka hai is karan se admit card ab available nahi hai. I regret the unfortunate situation you have got in Nirbhay. It is advisable that you keep yourself updated on the exam dates by bookmarking certain websites providing you the detailed info on the upcoming examination. There’s nothing which can be done for this case. However, you should contact the official authorities. They will show you some way. Hi Sunder, Kindly contact officials for this matter. Hey Shilpa Nair, Visit the official website and you will find an option/link Retrieve hall ticket. Click on the link and enter the necessary details.